Residential and commercial fires can be devastating, but with a little care and prevention, you can protect your family, home, business, and possessions. Install only UL approved stoves or fireplaces with clearances recommended by the manufacturer. Woodstoves need to be on their own separate flue. Clean and inspect all flues before the heating season. Burn only seasoned wood to reduce creosote buildup. Dispose of ashes in a non-combustible, metal container. 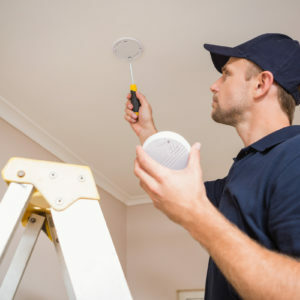 Properly install smoke detectors and carbon monoxide detectors on each floor of your home. If you have an older home with fuses, replace with a circuit breaker panel as soon as possible and make sure that your existing wiring meets current electrical codes. Do not overload extension cords or join them together for length. Throw away any aging cords or electrical devices with broken or worn cords. Keep a tested ABC class fire extinguisher in the kitchen and any room with a heating device. Never leave cooking pans unattended, especially when cooking with oil. Never throw water on a grease/oil fire. Equipment should be cleaned/inspected by a professional cleaning company on a semi-annual basis. Class K Wet Chemical fire extinguishers are required and should be inspected and tagged annually. Never burn candles in a closed area, near flammable materials, or leave unattended. Place on fire resistant surfaces. Trim candle wicks to prevent soot build up on ceilings and walls.